Interviews: Who’s THAT Travel Blogger? Let’s face it. You’ve got a week to explore the whole of Wales. Where do you start to get a good feel of Wales as a country? As I said in my previous post, when I fell in love with Pen Y Fan – the highest mountain in Brecon Beacons National Park, I realised that the best feature of Wales is its natural environment. It’s very true. Sculpted and ravaged through time, the rugged tops of Mountains, the gliding features of serene lakes, the resounding valleys that plunge through the horizon and even the deep and weathered caverns that sit darkly under the changing seasons of the air above, ALL contribute to what Wales have become today. With that in mind, and a long journey to Caernarfon at the other end of Wales, Tom of TomarHawk Travels and I decided to hit the road and simply take in nature at every opportunity. And we wouldn’t know what hit us. We needed to be at Wales’s northern westernmost point at the end of the day. So in South Wales’ Brecon Beacons National Park, the best way to start our environmental themed day was to drive south. 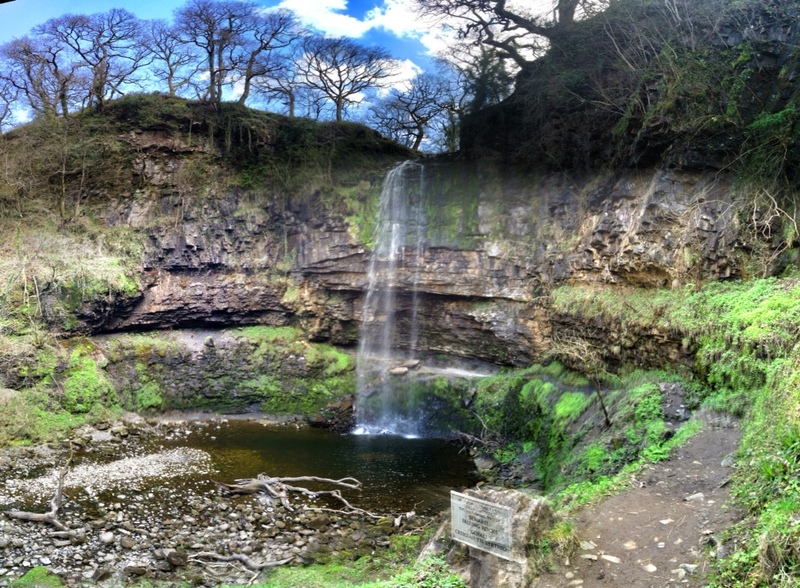 We simply wanted to kick off the day (even after seeing Pen Y Fan’s glorious bathing in sunrise), with a serious environmental Welsh Feature that found its way onto Batman’s The Dark Knight Films in recent times – The Henrhydd Waterfall. With a drop of 90ft, this truly is part of Waterfall County and you will be utterly astounded and charmed with a tongue in cheek to discover that this is Wales answer to Victoria Falls. Just situated outside the small village of Coelbren, this feature is easily accessible for people with good walking boots. From the Car Park, walk down and over the River Nant Llech in which you’ll soon hear the thunderous roar of Wales’ highest single drop Waterfall. I absolutely urge you to stand in the hollowed out open air cave behind the fall to appreciate the fresh and vibrant wonder of Wales natural beauty. Now it is time to head North. Sensing a last opportunity to view Brecon Beacons, we took the ‘rooftop‘ tour to gaze the views afforded to us by fantastic weather to see the rolling hills and lambs jumping for joy in the counties surrounding the Black Mountains. Fantastic far off views that they were, it wasn’t until stumbling upon another feature that we were astounded to see what Wales does proudly well. Artificial Nature. Known for its rainy weather, it comes to no surprise that Wales pipes fresh water to England, which has experienced ‘dry’ summers therefore, such wonders of Wales include their Reservoirs. This Reservoir Cray comes as we track over the Black Mountains through seemingly barren and sheep spotted valleys that sweeps away into the horizon as we left Pen Y Fan trailing behind us, heading north to burst out of Brecon Beacons. A truly outstanding feature indeed. If you open up a map of Wales, you won’t be surprised to know that much of the country is made up of National Parks, UNESCO Heritage sites, Sites of Specific Sciencific Interest, National Pathways etc. So, again, it comes to no surprise that it wasn’t long to reach another National Park after leaving Brecon Beacons within a short timescale. 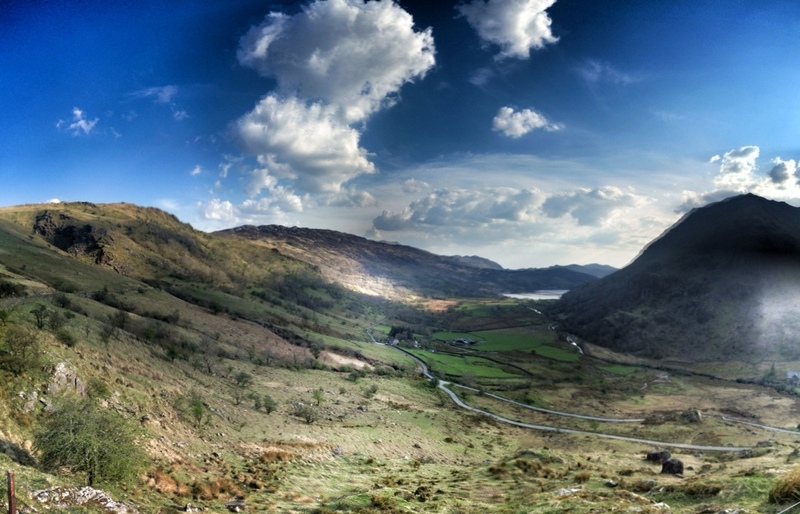 And Snowdonia definitely did not disappoint as our first view afforded us this. This charming town provides to be the natural pit stop for those doing a panoramic picturesque tour of Wales’ Natural Beauty from North to South or vice versa. Park up and park yourself down at this very authentic coffee shop where you can listen to the Welsh language singly spoken. This is not a tourist town and the residents know it. 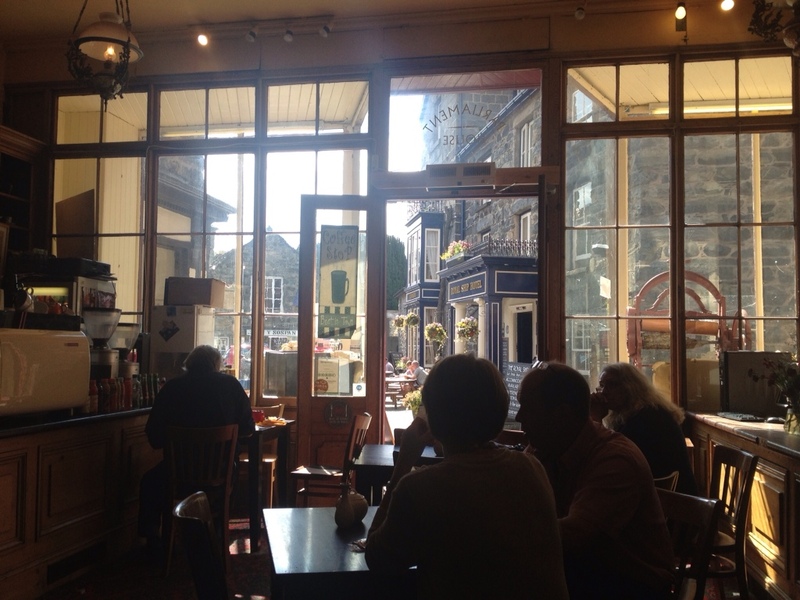 However, The warmth and friendliness of the locals is accentuated with the rustic atmosphere as they welcome you with open arms and simply ask you to enjoy their little slice of welsh heaven. Recharge yourself as you partake in a coffee or perhaps a Leek and Potato Soup, as you prepare yourself to be wowed over even more before climbing the peaks of Snowdonia. I know I needed to, after the joy of Brecon Beacons and what Snowdonia had to offer already. Keep following the A470 and you’ll pass by the quaint towns of Rhayader, Dogellau and Beddelgert before reaching Nant Gwynant. Wales winding and complex country lanes will guarantee to get you lost. But you won’t care. Shrugging our shoulders and following the road leading us through the wilderness beauty of Snowdonia National Park after taking a wrong turning, we simply didn’t care. We were loving the area. Cruising merrily along the eastern flank of Snowdonia’s Mountainous Peaks, we reached a lovely and raw landscape with Nant Gwynant. Overlooking 2 lakes, we simply had to stop and admire the afternoon daylight tinted waters. The second lake lies just in front of the peaks directly and with a dramatic sky, sunlight blinding us, this picture gave us a good view of the stark reality just how perfect Welsh landscapes are. 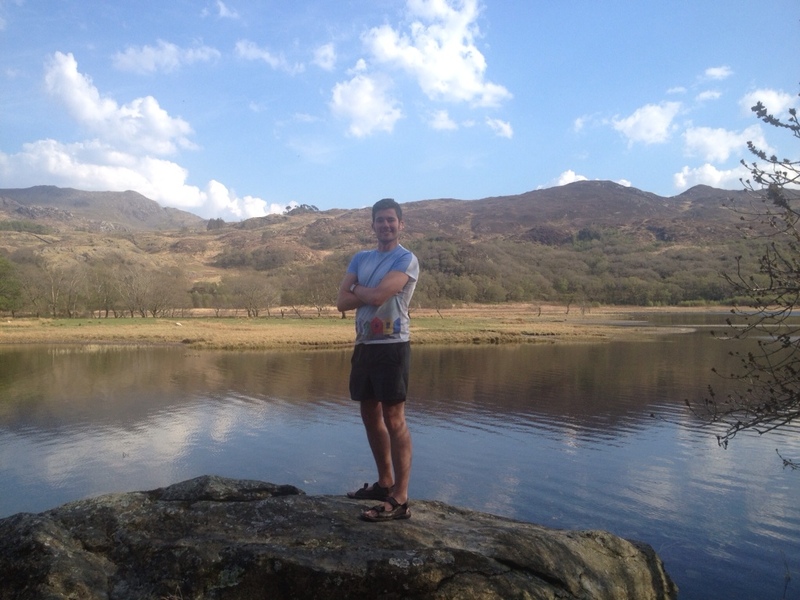 This would have been the ideal background setting if you were interested in learning the Welsh language at either beginner, intermediate or higher level at Nant Gwynant. Climbing up the Mountains of the Snowdonia Peaks, the scenery changed for the more dramatic. Winds started howling, the atmosphere turned more bleak, the wilderness turned rough but I’ve never felt so refreshed. This is Snowdonia. What made it even more dramatic was the peaks are the playground of RAF/NATO exercises. We were lucky to have stumbled such a deafening and awe-inspiring incident. Check out the video. However, as we observed the mighty splendour of the peaks, the day was fast rapidly turning into night. Our plans to scale the highest mountain in Wales, Mount Snowdon, lay at our feet in tatters as we needed to get to Caernarfon, the most welsh-speaking place in Wales, before dark. Cruising past Libanus, the central base for Mount Snowdon campsites and hikes, we made a pact. We will be back. Meanwhile, the beauty and inspiration of Wales’ Environment and Nature had us impressed and most of all, connected to the little land just to the west of England. First pictures of my amazing South Africa trip!